At 3:30 a.m. one morning in October of 2007, Donna Perry woke up to a hundred foot wall of fire. In the flurried scramble to evacuate, the confounding question became: what to do with the horses. After getting her own horses to safety, Perry said she and a few others went back to take care of her neighbors ponies who refused to be moved to safety. The terrifying experience, followed by several long days at the Lakeside Rodeo where most local livestock are taken during fires, put into sharp focus the question of equine emergency response. Insurance for barns, evacuation procedures and precautions, and fire protection for those already trapped are issues of great concern to Perry, and on Monday morning, Feb. 26, many of her fears were put to rest. 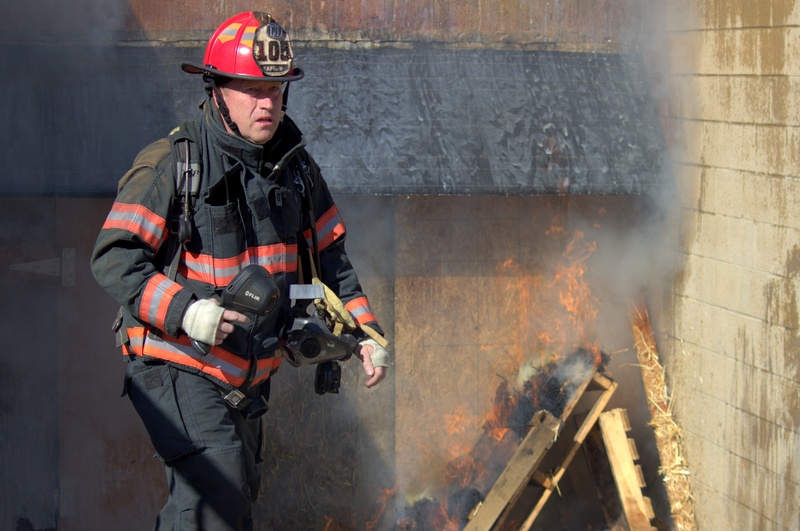 Atira Systems, aimed at providing a high-performing fire block gel, referred to as strong water, performed a demonstration of the next-generation gel technology, hosted by the Heartland Fire Department in El Cajon. After coating a dummy barn with the gel and lighting it on fire, Captain Woodrow Matthews suited up and measured the temperatures, which, he said, were close to two and a half times stronger than most wildfires. The dummy barn remained largely unharmed. Two more demonstrations were done inside the building, with similar success. Stephen Haddix, co-founder of Atira Systems, said the old solutions, though they did save buildings, were never well-liked by the fire fighting community or the neighborhoods they work to protect. “Having been a firefighter in my early career and then being a manufacturer, I had a love for combining the two and this was the the opportunity that I thought needed to be addressed the most,” said Haddix. But creating a better solution was like reinventing the wheel. Haddix spent four years developing the current solution in a barn in Oregon. Haddix said the effort paid off. The eco-friendly nature of the product is a big draw, attracting sponsors like late actor Paul Newman’s daughter Nell and Walt Disney’s granddaughter, Joanna Miller. Co-founder Jeff Denholm said environmental consciousness is an important goal of the organization. Atira is the Pawnee goddess of the earth, making the company’s goals apparent even in its name. The gel can last for hours, actively helps lower temperatures and can prevent flashback. Atira Systems has been testing the product with top state officials for the last three years, contributing two engines to the Blue Cut fire in San Bernardino, saving 200 homes, and two more engines to the Napa Valley and Thomas fires, saving nearly $200 million in assets. Haddix said this is a monumental step for fire safety. California has more horses per square mile than any other state in the country. Perry said that the time has finally come to address the concerns of livestock owners in East County and throughout Southern California. Wonderful, what a blog it is!